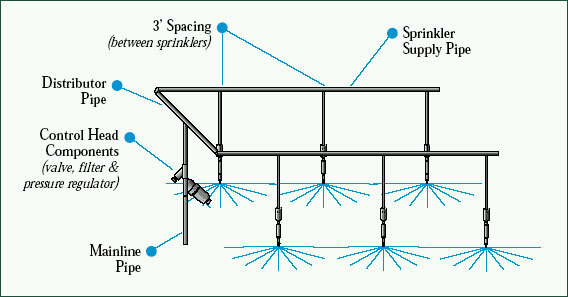 Easily create an overhead or bench top sprinkler system using our Netafim heads. The Netafim assembly provides water efficient, uniform coverage for both bench or floor crops and is easily adaptable to any greenhouse. Requires Hanging Assembly, 1/2" Mounting Adapter, or the Dan Retrofit Adapter (ordered separately). I've had these installed in my 20'x100' greenhouse for about 2 months now. These are vastly superior to the Senniger inverted mini wobblers that they replaced. Water distribution is highly consistent compared to the Senniger and, most importantly, the check valves work great and leak not a drop of water after the valve is closed! 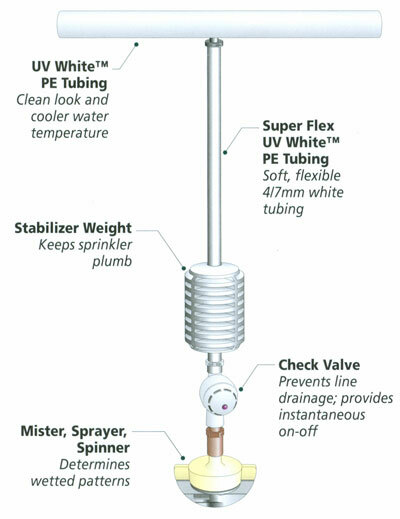 I found the Netafim design guide for sprinkler/pipe selection to be highly useful and accurate. I have used soaker hoses in my greenhouse, as I plant directly in the ground.I use Netafim Sprinklers now. They are awesome. It's like a gentle rain inside my greenhouse.Now I can plant anywhere instead of being stuck to a single row. And with the soaker hoses, it would get really dry between rows, creating an enviroment too dry for worms.I had to remove the shut off valve from the heads as they seemed to plug up with my hard water. But without the shut off valve they work fantastic. These are a wonderful product. No more washed out plants in my greenhouse from the after spray drip. I love these sprayers. Love the sprinkler, but of the 6 I bought, one will not turn on. I got another shipped out to me and it will not turn on either. They are operating under 30 PSI. It seems the check valve is very sensitive, so I am just taking it off all of them. Other than that they are wonderful! These head assemblies are functional and should win a design award.